We are getting closer to the big turkey day and I don’t know about you but my mouth is wat-er-ing!!! I found out that we are fortunate this year and everyone of our family is going to be here. So that means that we are potlucking, but that doesn’t mean that I am out of cooking. So my planner comes to the rescue again. Planning out what goes in when is key to making everything hit the table hot! The first thing to be concerned with is the turkey. One thing I learned the hard way, the turkey is frozen and it takes more than a day to thaw. General rule: 24 hours of thawing time in the fridge for every 4 pounds of turkey. If you are brining, add an extra 16 hours or so. In my case, I’ll be pulling my bird out of the freezer and pop his frozen booty in the fridge. Then there is cooking it…real world math at work. Determine your dinner time and subtract an automatic 30 minutes for the bird to rest. Then its about how big the bird is and whether it is stuffed or not. In the case of an unstuffed bird plan on 3 to 3.5 hours for a 10-18 pound bird and 3.5 to 4.0 hours for an 18 to 24 pound bird. Stuffed? Then a 10-18 pound bird show cook for about 3.5 to 4.5 hours where an 18-24 pound bird should cook about 4.5 to 5 hours. Count backwards from your 30 minute mark and you can easily figure out when Mr. Tom needs to step into the oven. Everything else can be cooked around the bird. Two keys when it comes to a bird, baste him approximately every 30 minutes to keep him moist and check the temperature about 30 minutes before the bird is due to be done. Once it hits 165 degrees, its done. Other little tips I have learned are infuse the bird with melted butter before cooking for a yummy taste and once the skin turns a beautiful golden brown, cover it with tinfoil while it finishes cooking. This seals in moisture but more importantly keeps it from getting burned. To save the time the day of Thanksgiving or any major meal, do as much as you can in advance. A few things that can be done in advance consist of prepping for casseroles so they are either cooked and can easily be reheated when its time or prepped them up till cooking the night before. Then all you have to do is pop them in the oven when the bird is done. How long it takes to cook and at what temperature helps determine which is better. You can peel and even boil potatoes the night before. If all you do is peel them, then make sure to store them in the fridge over night in a pot of water. I personally like this method because then all I have to do is throw them on the stove when I am ready to boil them. Either way, this saves time. You can do the same thing with stuffing by adding the stuff, minced onion and celery and other herbs and mixing together. When you are ready to cook or stuff the bird, just add the liquids. Both save time. Making relishes, such as my Grandma’s Special Secret Cranberry Relish, can be made 48 to 72 hours in advance. The added bonus is this only adds to the flavor! This also works well with many desserts such as pecan, pumpkin and apple pies. Once you get the bird in the oven, its all about planning when everything else gets done. If you have two ovens, this is way easier. If you don’t this becomes a tricky process. One of the easiest ways is have as much prepped in advance so that it be reheated as soon as the turkey is out of the oven. This is especially true for rolls and gravy. Figure out a different way to cook a dish such as serving something cold or room temperature that you might otherwise serve warm. For example, most of my appetizers this year are going to be cold dished such as various cheeses, meats and crackers, mixed nuts, pita bread and cucumber dill dip, and my one warm dish – Ramaki. Instead of roasting them in the oven, I have a simple microwave recipe that will make them hot yet don’t interfere with the bird’s cooking. Another option as you spread dish cooking through out the day is to cook dishes that you can cook on the stove (or microwave as above) versus the oven. This year, I will be making a green bean, mushroom, almond dish that I roast and pan sear in a skillet. Its an alternative to the traditional cream of mushroom green bean casserole. Be key, use a planning sheet to determine what gets put in when and check them off as you complete each dish. 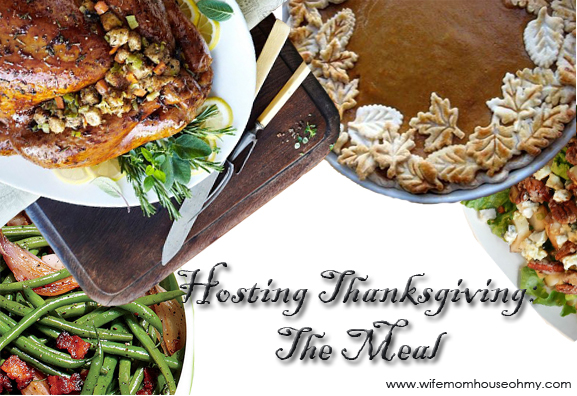 Do you have nay tips that have worked wonders at keeping you sane while you cook your way through Thanksgiving? Share below.